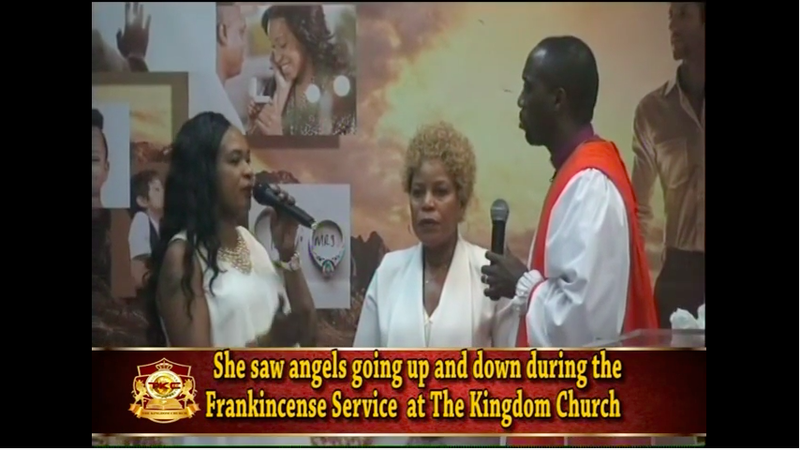 Woman Sees Angels Ascending and Descending from Heaven During Frankincense Service! Morning Glory Frankincense Miracle Service! Tomorrow is that special time of the month, when we prepare for what’s ahead and what God is going to do. As you know God works in seasons, and that’s why every month there is something new and different that you can expect from God IF you are flowing in the spirit with Him. Since we began holding this amazing service, so many things have happened not just during the service, but afterwards in our church, in our members and partners lives. There is an anointing that we have tapped into and I want you, no matter where you are, to be a part of it. But I don’t want you to take this email just like the rest of them. For God has spoken to me that something different is going to happen tomorrow. A special personal encounter is about to take place. There is a Reason why God has connected us. There is a reason why God has chosen you to be a part of this ministry. Whether you attend in person, or you are 10,000 miles away, it doesn’t make any difference. Because in God, there is no such thing as distance. Angels move faster than the speed of light, and that is how quickly your breakthrough will come tomorrow. Just like the woman in the video saw the angels of God ascending and descending, tomorrow they will be bringing your blessings down from heaven. 1) God Is Going To Meet You Personally – Tomorrow is a special day and a special appointment. I am believing God to show up personally in your life in a special way. Yes there is something that you need to breakforth, something you have been waiting on for a long time but it seems that the heavens have been shut until now. Tomorrow if you show up, God is going to show up. The time for your favour has come. 2) There Is An Angel Assigned To You To Bring You Good Luck And Favour – So many times in the Bible we see great men and women of God being visited personally by angels sent on divine assignment by God. Tomorrow there will be special angels assigned specifically to you. They will be there to minister to you, to help you move into a deeper realm of God, to experience a greater blessing than ever before. Remember it is the angels that lift up your prayers before God, how much more when you will have personal angels working on your behalf! 3) There Is A Special Miracle Waiting For You – Have you ever experienced a breakthrough in one part of your life while other parts of your life seem to remain the same? Well tomorrow I see a special gift, a special miracle from God, yes I see it coming down as a present. You are precious in the eyes of God, and He has something special for you coming tomorrow. 4) I See 4 Pillars In Your Life That God Is Going To Establish – Yes 4 areas in your life that God wants to bless you in this month. This could be your family, your finances, your health, your career, etc. And tomorrow is the preparation day. It is the warm up for what God has for you this month. Remember before you start to build anything, you must always plan and prepare first. I see that happening tomorrow. I see God putting in you a new energy, a new wisdom, a new hope, a new vision, a new excitement that will open yourself up to what God has for you this month. Yes I see him directing your ways but it all starts tomorrow. This coming week I will be releasing your personal word of Prophecy, and it’s all going to connect. God has something so special for you this month. April is the time when spring begins, plants and flowers come back to life, animals come out of hibernation, new life begins. In short, the season changes. And this is one of those times spiritually as well. First, remember to wear white or something white, even if you are watching online from home. Remember there will be a special angel assigned to you tomorrow, and one of the things they are looking for is that white cloth. Second, prayerfully prepare your prayer list, write down the things that you want God to do in your life (only positive things must be written on this list). For the angels will bring your requests directly to the throne room of God, whatever you ask for according to His will, it shall be granted. And Third, I want you to give a Special Offering for this service. It is a special offering of £40 according to the number 4 for April. Remember this is your preparation for what is to come. Before I release your prophetic word of the month, I want you to engage yourself in tomorrow’s service. In your prayers and in your giving, don’t hold back. I know the anointing that God has placed upon my life, and every word I speak it comes to pass. Not for my glory, but for HIS. And that is why it is so important you pay attention to every instruction I give you. Don’t become familiar or take it as a light thing. Because it is from God. And God is going to perform His word in your life tomorrow. Click Now To Submit Your Miracle Frankincense Prayer Form! Deadline Closes Tomorrow at 8AM GMT so Submit your prayer request Now! Today Discover How You Can Give Thanks In Everything! Read From Our TKC Guest Blogger, Prophetic Word From Bishop Climate & More! Today Declare Let Me Inherit A Double Portion! This Week Declare My Star Must Arise! Greatest Decision Ever To be made, She made It Can You Click Here Now !